A couple of years ago we went around an asked alumni from the 90s what they thought was in a Skylab from Murphy's Tavern ("Murph's"). 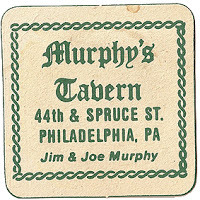 While we got many funny responses on video, I just got a response from Jim Cleary, a member of the Murphy's Tavern Alumni facebook group telling me that a bartender who made Skylabs has now revealed the secret. After the jump, get the answer! "A generous helping of: vodka, southern comfort, tequila, and jack daniels. Then add some pineapple juice and cranberry juice - and a touch of grenadine (bartender's secret....when ever we ran out of something it was pot luck - as long as it looked red)"
Out of all the video responses we got, it seemed like our interviewer Noah Sferra (C'96) remembered the most!